Click the galleries at the right and be sure to scroll down the page as most recent additions are at the bottom. Click here and see what people are saying about "Voices in Exile"
Read how your donations help! You can always order from or donate directly to The Tibetan Photo Project while you are visiting this website. We will send you a copy of "Visually and Respectfully Yours - The Story of The Tibetan Photo Project when you donate online or by check. You can also now rent or buy both "Voices in Exile" and "Visually and Respectfully Yours - The Story of The Tibetan Photo Project" feature length documentary films for online viewing at http://www.nomadsland.com where you will find our films by scrolling the list of titles on the right side of the screen at the site. Or have a screening party and while supply lasts and invite 10 or more people and promise to send us photos of your gathering and we will send the DVDs for free... (DVDs for screening parties is limited to what we can afford) We will even supply recipes for the momos and butter tea. Email us to get your screening party pack today! Vote now to put this on national television!! Gallery #9 -12.6.03 Photos by: Lobsang Topgyal Photojournalist, based in Dharamsala. 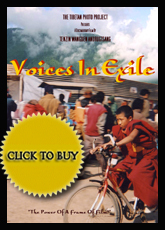 "Voices in Exile - DVD coming in spring 2005"
Gallery #18,Dogga Center -Thanks to Rinchen Tsering for pulling together more views of McLeod Gang through the Dogga Center. "Voices in Exile - DVD coming in summer 2005"
Gallery 61- Mendicino Premier of "Visually and Respectfully Yours-The story of the Tibetan Photo Project"
Gallery 62- Photo wall of changeing images to enjoy and download. Gallery 63- DVDs to the U.S. Senate- See how to help! Because we get requests for prints of these unique images, we are offering three at this time. As we are new at offering prints, we estimate that between 1/2 and 2/3 of the price you pay for the print will go to benefit the Tibetan causes as described on the order form. One dollar from the purchase of each print will be used to help seed the Tibetan Photo project. All images are Copyright 2000-2011 Joe Mickey, Sazzy Varga and the Tibetan Photo Project and may not be published without permission. While you may print the material on this site for easy reading or sharing with friends. For feature articles, publication or public use of any of the material or images contained on this site please contact Joe Mickey via e-mail at thetibetanphotoproject@gmail.com and please reference your e-mail to the Tibetan Photo Project. Thank You.